The global marine industry represents a multi-billion-dollar per year business. Its main activities are related to natural resources that are abundant in the sea (especially oil and gas), to communication and trading gateways between continents, and to fishery. As part of these activities, underwater infrastructures exist and operate across the globe. Some examples include submerged pipes and cables for the transfer of gas, oil, power, or communication signals, and harbour infrastructures for shipping support. Currently, the monitoring, securing and maintenance of these marine infrastructures are performed manually, which requires investing considerable manpower, and limits operational capabilities to the establishment of secure marine areas of limited size. ThreatDetect targets the design of a novel autonomous detection system for divers and mines, and the development of a prototype for the demonstration of the system's capabilities. 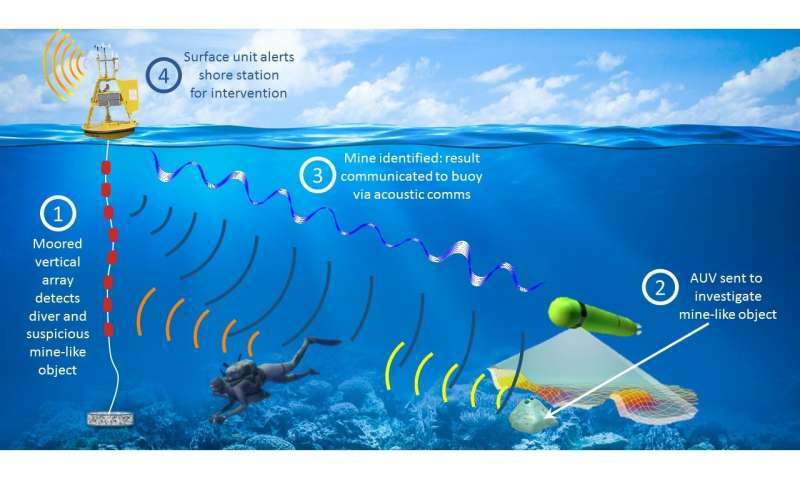 In the specific case of a detected mine, the system combines active acoustic remote detection with detection verification through target recognition by an approaching Autonomous Underwater Vehicle (AUV). Potential users for such technology are operators of gas rigs, owners of infrastructure for international communications, sea explorers, and navies. The developed technology will make it possible for such users to significantly reduce maintenance and security costs, and to provide better coverage and much faster response to catastrophic events. "The main concern in the design of an autonomous system for the protection of marine infrastructures is the need for adaptation to different environments. In the cases of diver detection or mine identification, this translates into the detection of objects of unknown shape and size", says ThreatDetect's PI Paolo Casari (IMDEA Networks). "Since divers and mines are expected to be on the surface or close to the surface, it may be hard to distinguish between the desired target and unwanted noise or signals created by waves or passing fish." "Considering the above challenges and opportunities, we believe that a proper solution is to apply acoustic detection for identification of a diver, and a combination of acoustic and image-based target detection to detect a submerged mine", continue co-directors Roee Diamant (University of Haifa) and Lutz Lampe (University of British Columbia). 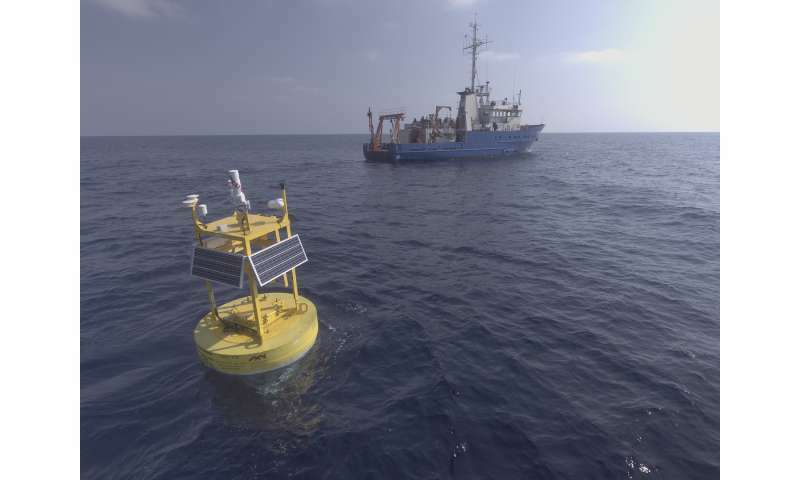 "In the latter case, acoustic signal processing provides detection and target localization, and the imagery data is obtained by sending an AUV at a safe distance from the suspected mine, in order to inspect the object using optical cameras or sonar imaging. This serves as a detection verification. The communication with the AUV is based on underwater acoustic signals. This way, the system can send the AUV the approximated coordinates of the target, and can receive back the processed target image." "We plan to build a system that joins cutting-edge detection technologies with localization and communications, and to improve its flexibility thanks to the mobile platform offered by the AUV", concludes Casari. "Designing and prototyping such a system entails several significant challenges, but has the potential to provide new methods to secure marine infrastructures from unwanted threats." ThreatDetect was selected for funding by the NATO SPS office as a 3-year research project. The project consortium comprises two members from two NATO member countries (IMDEA Networks from Madrid, Spain and the University of British Columbia from Vancouver, Canada), as well as one member from a NATO partner country (University of Haifa, Israel). Dr. Paolo Casari (director of IMDEA Networks' Ubiquitous Wireless Networks group), will be the principal investigator of the project. The group will specifically focus on project activities related to underwater localization and underwater acoustic communications. The project will run until May 2020, and will advance research and development on the protection of marine infrastructures from external threats.